That's it really, Its 10.38pm here and in 12 hours i'll be checked in ready for my flight to LONDON !!!!!!!!!!!!!!!!!!!!!!!!!!! Am I likely to get any sleep tonight....errr no, I'm in a state of nervous excitement. Now I'm packed, I've got the hairdressers and french lessons tomorrow but I found myself at a slight loose end yesterday, so I got on with quilting the tumbler runner. I'm thinking it'd be appropriate to give to Jacques teacher, he's leaving her class in July, even though he's staying in the school and she's helped him lots. She's quite old fashioned so my first idea of a small pencil wall hanging went out the window and I thought she'd appreciate the colours of Petite Odile, there's french things, there's pretty school girls, there's letters and muted colours. So it needs binding and washing and it'll be ready to wrap. 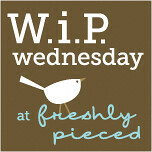 I'm linking up with Freshly Pieced for WIP Wednesday and hope it might even make TGIFF if I get some free time tomorrow night. I'll be leaving on a Jet plane on Friday morning :O) might not get chance to blog, depends if my phone battery lasts out but I do believe there will be lots of photo's and things to show when I get back. This time I got an email from our busy little bunch to say I'd won this great 241 tote. Isn't it lovely and it's one of the patterns I was going to try my hand at after seeing some great bag pictures (loads of people are bringing 241's to the R word...) and now I won't have to :) was a bit worried about the Z word !!! I spent Sunday putting on the borders for the Fugly (love my Sizzix 2.5" die) and then had to make the frame upto Queen, I *just* had enough room in the sewing area but did have to crawl down underneath it to change bobbins. During the Eurovision song contest I sat and sewed the rest of the binding on.. The quilting isn't the best, I was trying some loops on the borders and e's and l's....imagine my surprise when I look and some of the stitching was BLUE !! I've made this prototype bin in case I'm needed for the swop, I've got one and used it to copy, I love mine, I take it with me to patchwork club or when i'm cutting threads, hexagons, little bits and pieces and it folds up into nothing. Lynne at Lily's Quilts has opened up the linky party, Lynne's work I've admired for ages and I follower her blog, never quite believed I'd meet her, unfortunately I didn't get in the Union Jack class but i'm hoping to have a chat to her about it. 12 years later we're married, shipped ourselves over to rural France (to escape speed cameras, me having to work in London and for a nicer fresher, different life to bring our kids up in) I'm a 37 year old (JUST 37!!!) SAHM and we have 2 kids who are now bilingual being born in France and because they are both in full time school (except for Wednesdays which are the nightmare days for me, they have wed's off) I get more chance to sew. I wouldn't say i'm even intermediate, mainly because i'm self taught and even though I go to a patchwork club here in France, they do everything by hand GRRRR and it's more of a sit and stitch than classes. It's why I'm so excited to be going on retreat, to have english speaking teachers who hopefully might have enough patience and might even teach me how to cut a square square.... why can I not do it ??? My zipit zips arrived, really quick think I ordered them and had them delivered within 4 or 5 days..
see all the lovely colours and two of them are winging their way to the UK for my pouch class. And just because I can, here's the fabric that arrived from Fabric Shack, now remember I had the clutch bag fabric and also some other brit fabric is on it's way to UK and this is the rest along with my moda solids... Can't believe I forgot to order black DOH !!!! clutch bags are go !!!!! Help....how do I cut something square ??? Is it really that difficult or is it just me ?? ?